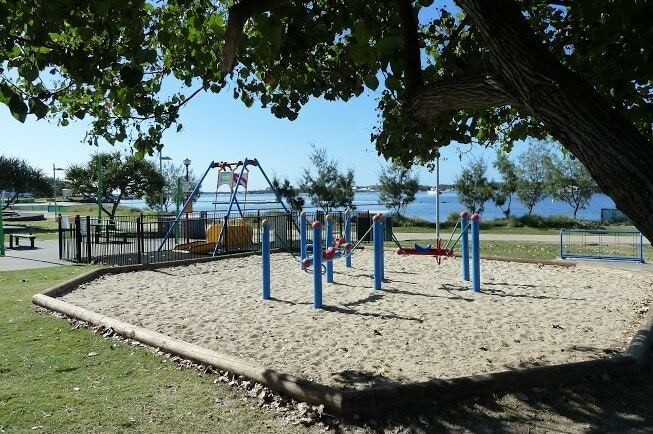 Even though it is at least 40 minutes from Brisbane (depending on where you are starting off from), there is so much to keep our little Brisbane Kids occupied at Broadwater Parklands that it is easy to spend the whole day there; making it well worth the drive. 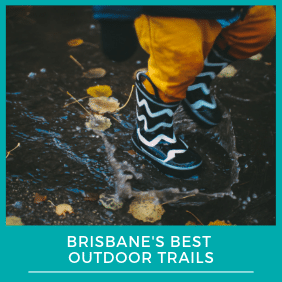 Broadwater Parklands has a zip line and monorail track for the older Brisbane Kids, and the shaded jumping pillow is great fun for all ages. 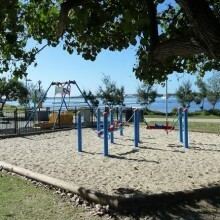 There is also an unsheltered sand-based playground featuring swings, slide and climbing equipment. 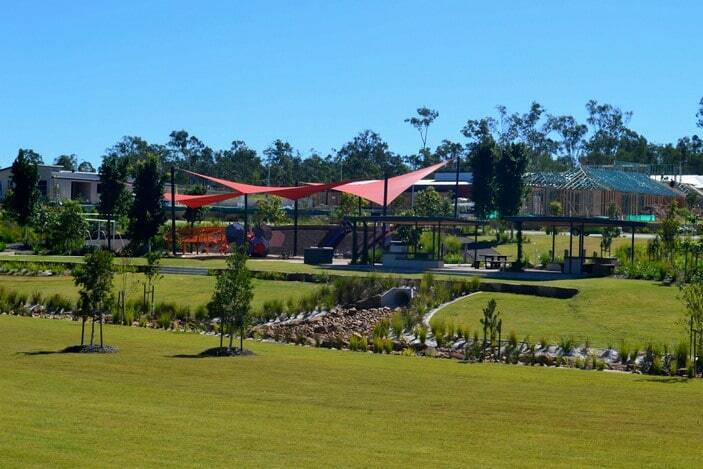 A shallow water park is located right next to the café, complete with sprinklers, waterfalls and shallow splash pools. 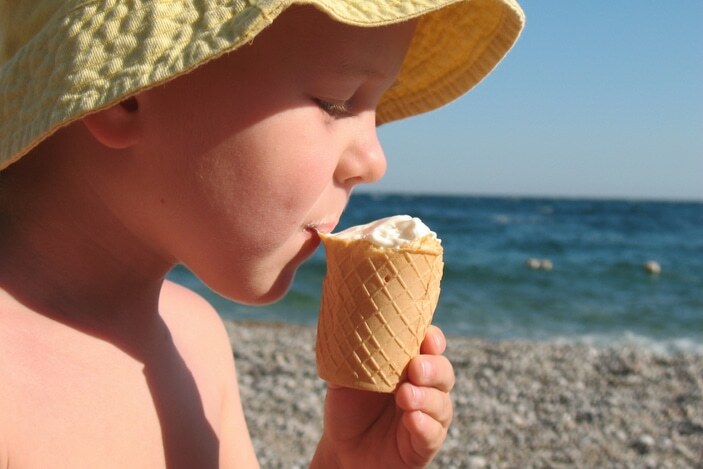 The water is regularly recycled using seawater. It is closed every Tuesday morning until midday for maintenance. 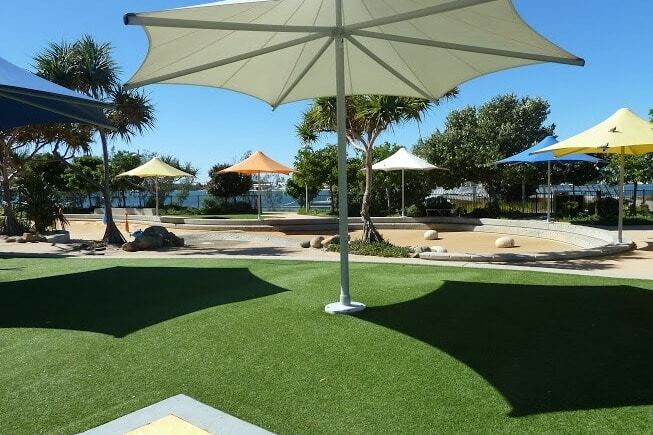 There is also a swimming enclosure opposite the jumping pillow on the beach, where permanent shade structures have been erected. 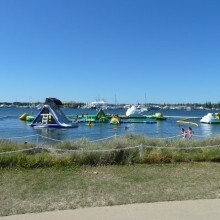 In the summer months, there is an inflatable aqua park for older kids and adults set up in the swimming enclosure (paid entry). 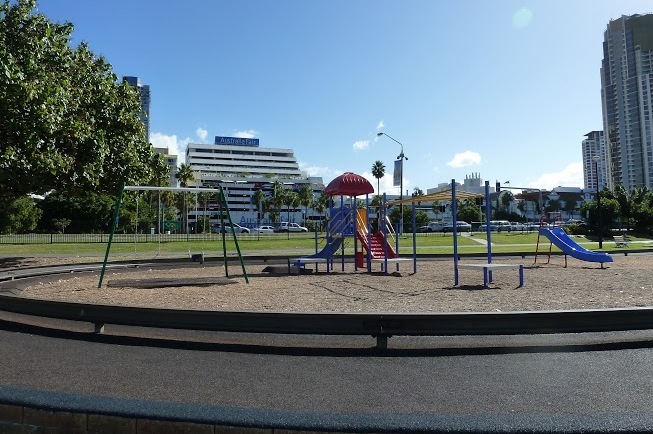 Little Brisbane Kids would probably most enjoy this feature of the park during school hours, so they don’t get swamped by larger kids. There are a few ducks in the wetland area, along with purple swamphens (pukekos) and sacred ibis. Of course, seagulls are also in abundance. There are climbing trees scattered through the park, but one of the most popular is near the swing sets, where the branches are low enough for even small children to climb. 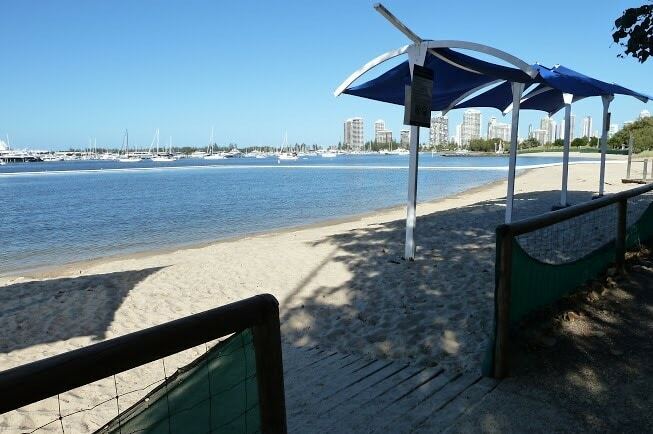 Dogs are permitted on leashes throughout the parklands but owners should observe signage regarding access to beach/swimming areas. 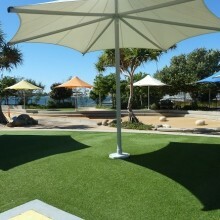 Broadwater Parklands is a summer paradise for kids but is equally exciting on sunny winter days. 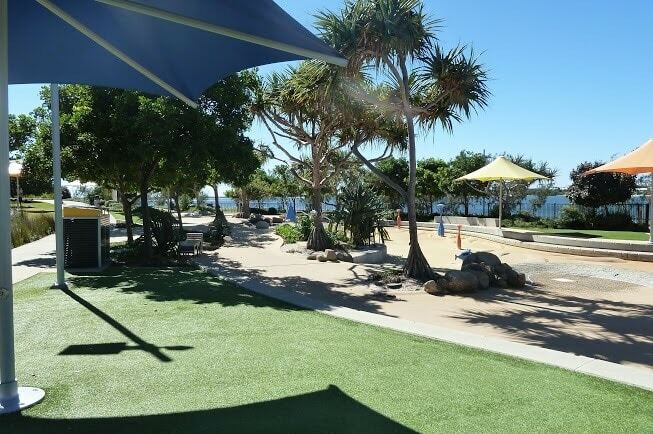 The trees are perfect for climbing and playing desert island adventures, whilst the sandy beach makes sand castles and expansive sand towns possible. 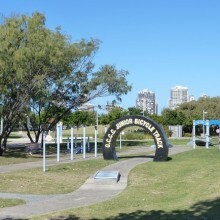 The monorail track is always popular, as is the bike tracks for mini BMX riders. 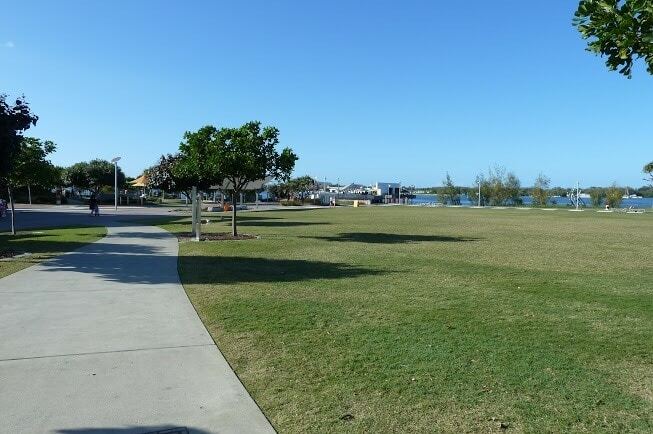 Broadwater Parklands has plenty of concrete walking paths that form part of a much longer walk from Paradise Point to Coolangatta. 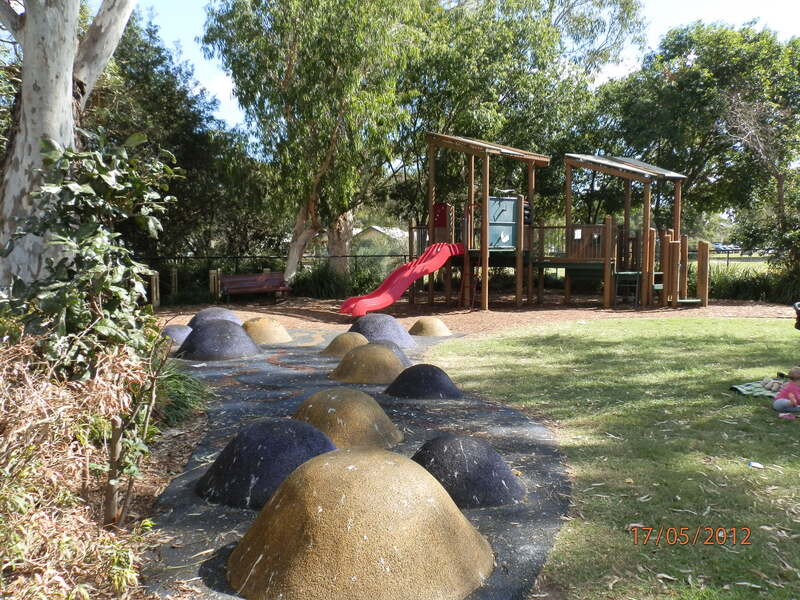 There are many toilet blocks throughout the park, including disabled toilets. There are also baby change tables for small infants but we have found them not to safely hold a toddler (weighing around 15kg). 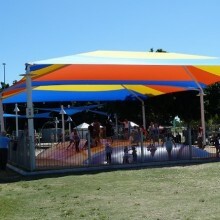 The playground features a liberty swing for all abilities. 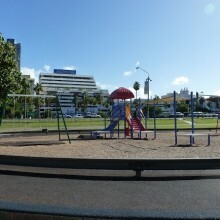 The area is mostly fenced, but not entirely, and although Marine Parade is a busy street there are unfortunately a few gaps in the fencing to allow pedestrian access. 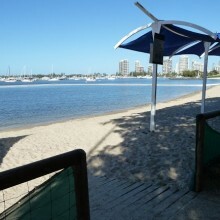 Additionally, the beach areas are not fully fenced off although there are barriers along most of the way. 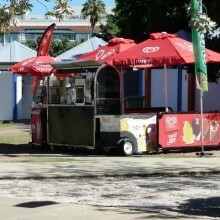 There are four electric BBQs near the main playground area, and many covered table areas near the main playground, plus shady trees and umbrellas in random places on the large lawn area closest to the café. 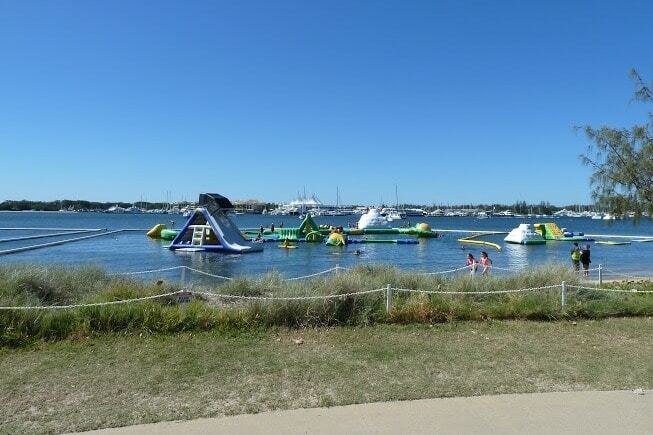 The Broadwater Parklands are extremely popular in the school holidays, particularly in summer because of the water park area. 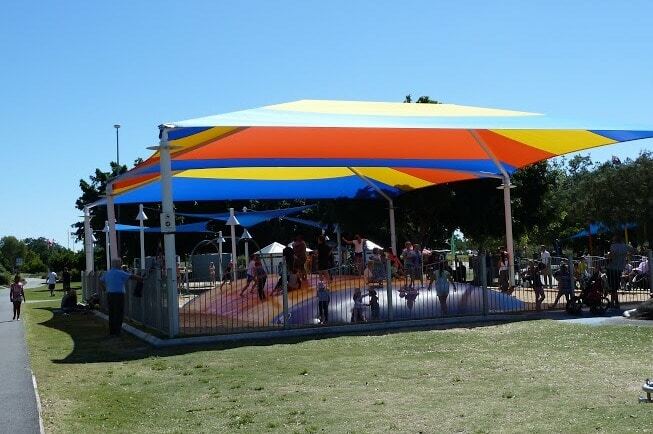 Australia Fair is also across the road for a bit of retail therapy while hubby or grandparents play with the kids. 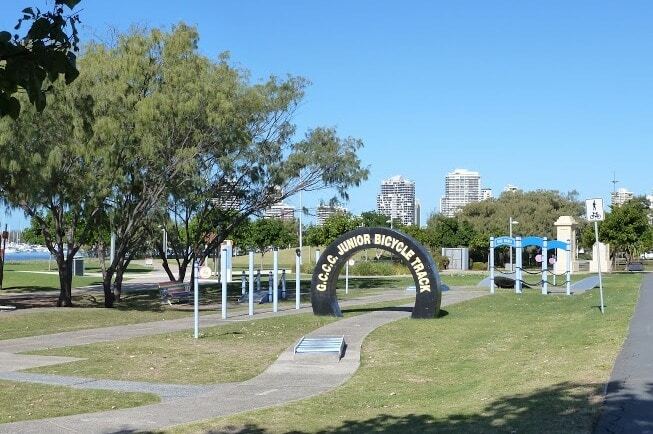 There is ample off road parking, although it is paid parking, which is strictly enforced by Gold Coast City Council. 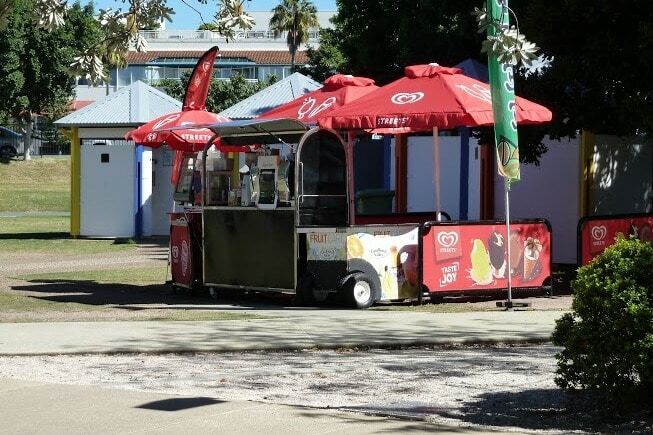 There is a café not far from the main playground and during peak times, they also have a coffee cart nearer to the playground. 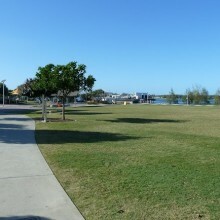 Broadwater Parklands is located on Marine Parade at Southport on the Gold Coast.